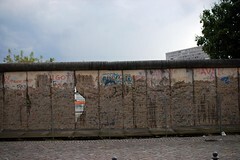 This entry was posted in travel and tagged berlin, berlinwall, books, metafilter, travel by alison. Bookmark the permalink. 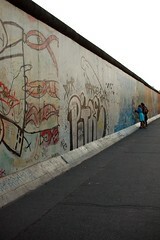 East/West Germany is one of my favorite subjects, too. I was at the 10-year celebration in Berlin, which I can’t believe was now 10 years ago. At the time there was lots of fascinating looking stuff on TV about the Wall, which was frustrating, because it was all in German and my German wasn’t good enough to follow it all. As for media, I recommend reading “Stasiland” by Anna Funder. Also, if you haven’t already seen The Lives of Others, see it! And Goodbye, Lenin is a German film (on the cute side) that gives some insight. Wings of Desire is also a good one to watch. Two other things to check out, even though they have much less to do with that subject and more with other parts of German culture: Christiane F: Wir Kinder vom Bahnhof Zoo, and Gegen die Wand (Head On is the English title). Even better, speak to Germans who grew up there, if you have the opportunity. And you might want to research stories about trying to cross the border (several of which are described at the Checkpoint Charlie museum). Good luck in your quest. Your travel plans sound great! As someone whose travel map looks gobs smaller than yours, I’m impressed with where you’ve been. And as someone who reads your site and follows you on Flickr, I highly encourage you to travel gobs and gobs. That way I get to travel vicariously. This is totally on my list, though I’m afraid it may be one of those things where the idea of it is way way better than the reality. Also, everything I’ve read about travel in Russia kind of scares the hell out of me. But I do want to make it at least to Moscow and St. Petersburg someday, to scratch my Tolstoy/Dostoevsky-inspired Russophile itch. I’m sad I haven’t been able to travel much the past few years. It was kind of a choice between that and saving to quit work and try this crazy project and all. I do think I’m going to drive all around the country and visit internet people like you did at the end of this hiatus though. I want to get abroad too, but airfares have become just ridiculous. Maybe when I’m a student again next year. you should come to canada on one of the years in between! Another vote for Stasiland. I read it several months ago and it was one of the most fascinating books I’ve ever read. Also, it has some narrative (and a narrator) in it so I think it would appeal to people who aren’t big non-fiction readers. Your maps are impressive. I’ve got half a dozen states and ONE country outside of the US, South Africa. That’s it.